Paco de Lucia was born Francisco Sánchez Gómez in 1947 in Algeciras, a southern port city in Spain. He learned the guitar from his father, his brother, and family friend Niño de Ricardo, a virtuoso. By age 7, de Lucia was playing flamenco guitar; by 12, he was recording. Before his teen years, he had won several guitar competitions. By 13, de Lucia was touring internationally with José Greco’s flamenco show. He started composing and playing backup for various Spanish singers, notably the great Gypsy singer (or cantador) Camarón de la Isla, with whom de Lucia worked from the late 1960s until the early 1990s. In addition to leading his own group, de Lucia has collaborated on projects with John McLaughlin, Chick Corea, Al di Meola, and even Placido Domingo. De Lucia is widely regarded as the finest living flamenco guitarist—and one of several musicians who has modernized the classic Spanish form. Here’s the thrilling, no-holds-barred, blazing-guitar, high-energy concert recording that caused many rock fans to pay attention to a flamenco guitar player. 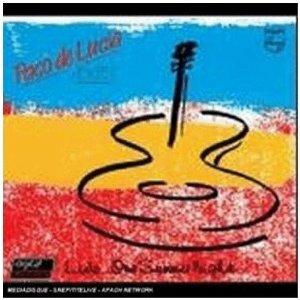 Recorded by de Lucía’s Sextet in 1983, it’s terrific ensemble work with de Algeciras, a flutist named Jorge Pardo, and an equally facile percussionist, Rubem Dantas. John McLaughlin composed a pretty intro to “Alta Mar,” and “Chiquito” is dedicated to Chick Corea; listen for strong 1980s jazz/fusion influences in de Lucía’s interplay with electric bassist Carlos Benavent, and the flute and guitar arrangement that begins “Gitanos Andaluces.” But it all comes back to de Lucía’s straight flamenco.